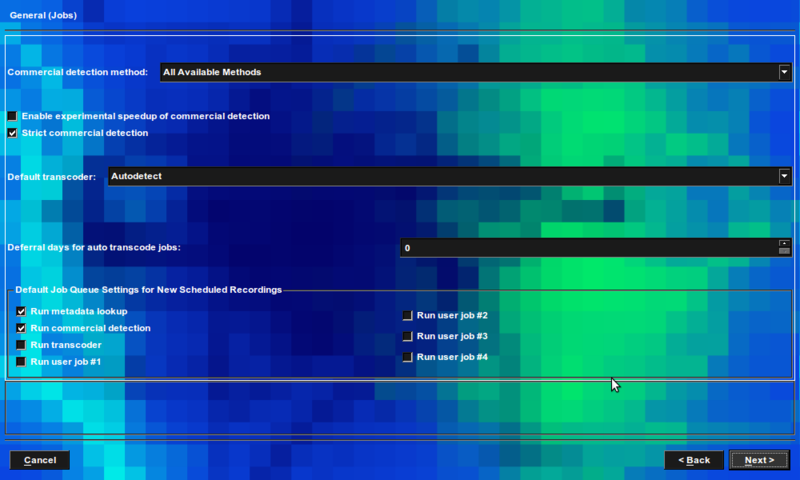 Difference between revisions of "Enhancing Recordings with Metadata Lookup"
Navigate to Setup->Video->General. Press ''next'' until you are on the third page of settings. You should see a checkbox marked ''Run metadata lookup''. Check this box, and then press ''Next'' repeatedly until you can press ''Finish''. Press ''Finish''. 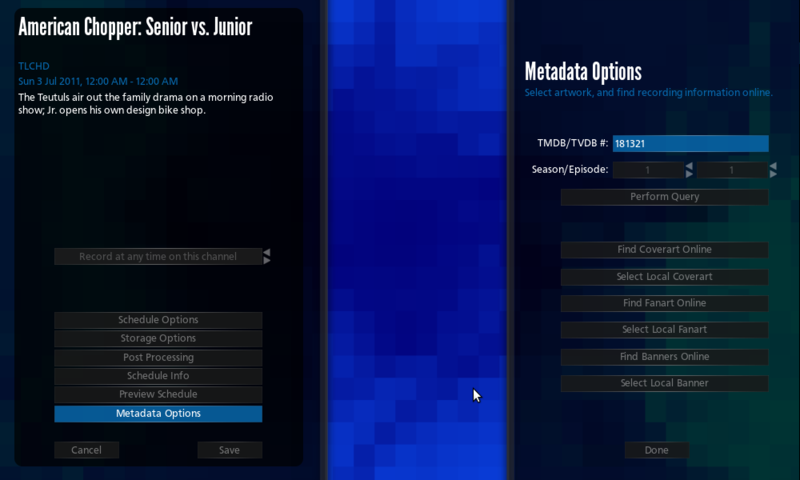 In MythTV .25 and newer, external metadata scripts can be used to enhance the information available for your recordings. As of this writing, no listings provider supplies information such as season, episode, or internet reference number (inetref, like a TVDB or TMDB number). Instead, MythTV can use the information the provider does provide and perform a lookup on various internet sources for additional missing information. Note: This step is usually unnecessary in new installs. By default, all recordings will attempt to gather additional metadata. This step is only necessary for existing MythTV users. Metadata lookup is a job, just like commercial detection, transcoding, and user configured jobs. As such, you need to tell MythTV's backend that it's allowed to perform metadata lookups. In mythtv-setup, select the General settings. Press next until you are on the third page of settings. You should see a checkbox marked Allow metadata lookup jobs. Check this box, and then press Next repeatedly until you can press Finish. Press Finish. If you want to make sure that all recording rules that you create in the future perform metadata lookups, you should configure MythTV's default recording settings. Navigate to Setup->Video->General. Press next until you are on the third page of settings. You should see a checkbox marked Run metadata lookup. Check this box, and then press Next repeatedly until you can press Finish. Press Finish. Note: If you have set the default recording settings to always grab metadata, you do not need to perform any extra steps. This step is only for those who want to pick which recording rules grab metadata individually. 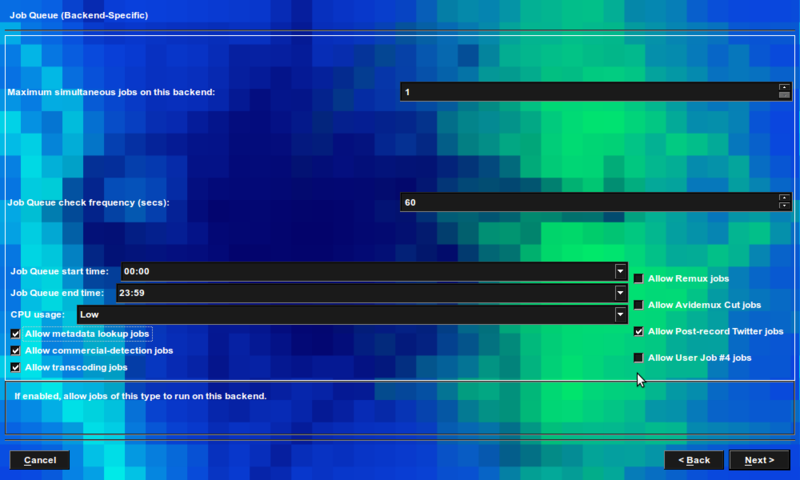 Note: Not all themes support this enhanced functionality. If you are unable to follow these steps successfully, you may need to change themes. The theme pictured here is Arclight. When you edit a recording rule anywhere in the MythUI, you will always see the same Schedule Editor displayed. Here are the steps you should take if you want to have metadata lookups performed on an new recording rule (Or if you've upgraded and are changing old rules to perform metadata lookup). 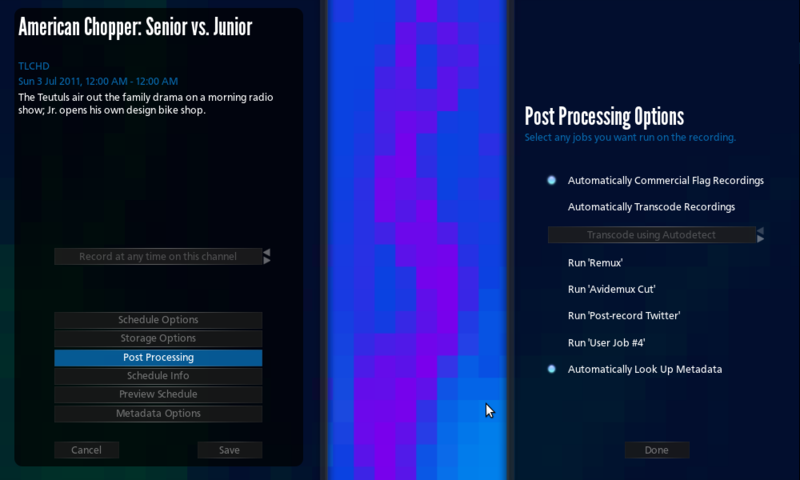 Click the "Post Processing" button. Make sure the "Automatically Look Up Metadata" option (wording may vary by theme) is checked. Press Done, then save the recording rule. Generally, MythTV's metadata functionality is "set it and forget it." Assuming your favorite show has a unique name, you get good guide information, and the metadata sources (TheTVDB and TheMovieDB) have a record of the show or movie, simply setting up a recording rule is enough. MythTV will handle the rest. But what should you do when your show isn't uniquely named, or when the metadata source calls it something else? Let's take the American television show "Castle" as an example. Schedules Direct, the North American listings provider, refers to it as "Castle" (of course!). TheTVDB, however, refers to it as "Castle (2009)" because there were other shows named Castle that came before this one. Other times, a show will originate in one country and be remade abroad. "The Biggest Loser" has shows in dozens of countries! Each of them has a particular naming at TheTVDB. MythTV solves this problem elegantly. All you need to do is tell the software which one is correct once, when setting up the rule, and all recordings made on that rule will get the correct Internet reference number (and thus will be assigned correct season and episode numbers, among other information). Here's how. When you create a rule for any show, it's a good idea to open the "Metadata Options" settings page. MythTV will automatically attempt to find the right show based on the Title and Subtitle presented. When it's not able to find the right show because there are multiple matches, you will be prompted immediately to select the right show. Based on the artwork, year, locale, description, and other information, it should be pretty easy to pick the right one. That's it! Simply press Done (wording varies) and save the recording rule. If you fail to open the Metadata Options settings and save the matched number, MythTV will still do its best to provide you with good, up to date metadata. It's just going to do a much better job if you give it some help! Additional metadata is by no means a requirement to enjoy MythTV. However, we live in a data-centric age where television is more commonly referenced by season and episode numbers than subtitle, or when it aired. Moreover, having access to this information makes it much easier to organize your files, transcode and name exported content, and to pick artwork. Having this information accessible directly from the MythTV user interface is fun and helpful.